Fr. Rama P. Coomraswamy, M.D. (born 1929 – died 2006), was a self-professed Roman Catholic priest who converted to “Catholicism” at age 22. He was ordained to the priesthood by Bishop Jose Gaston Ramon Lopez (a sedevacantist bishop) at the presence of Fr. Malachi Martin, a Vatican professor and a close friend of John XXIII and Paul VI. Fr. Rama Coomaraswamy was born as the third child to the famous art philosopher and pagan father, Dr. Ananda Coomaraswamy, who specialized in the scholarly studies of Indian culture and Hinduism. Some of Fr. Rama Coomraswamy's most notorious activities include being Mother Theresa's personal physician, brain surgeon, psychologist, psychiatrist, seminary professor, university professor, and a priest. In his theological works Rama P. Coomaraswamy buries the idea that the Vatican II sect is the Catholic Church that Christ founded. Coomaraswamy discusses in detail what 'tradition' (the teachings and practices which comprise the Magisterium) mean to a Catholic. Using as evidence Christ's own words, the Epistles, Church Councils, papal pronouncements, and history he demonstrates that, for a Catholic, the Magisterium cannot change. However, the Vatican II sect argues that the Magisterium can change. Thus the Vatican II sect is not Catholic. Fr. Coomaraswamy explains that most of the 7 sacraments have gone invalid. His position was that the New Rite of Episcopal Consecration for Bishops and Ordinations for Priests are doubtfully valid due to defect of form and intention. (It must be pointed out however that the New Rite of consecrating Bishops and the New Rite of ordaining Priests must be not only be considered doubtful, but also invalid. See Why the New Rite of Ordination & New Rite of Consecration of Bishops are Invalid). The New Rite of Holy Orders as stated by Fr. 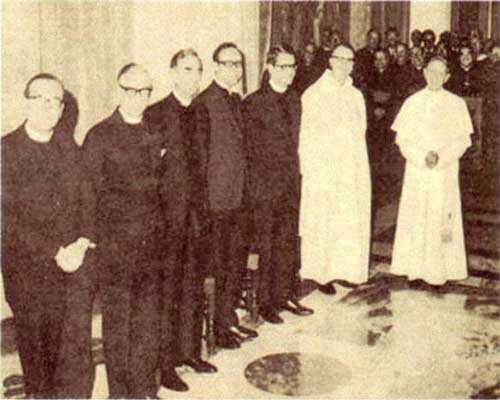 Coomaraswamy were changed by “Archbishop” Annibale Bugnini—who was the primary architect of the New Mass and a Freemason—and the 6 Protestant ministers who composed the Novus Ordo Missae (the New Mass) for Paul VI. It is thus true to say that Vatican II made their "Mass" more Protestant, and specifically Anglican. This is not even debatable: this is supported by the Vatican II instigators own words and deeds. The six Protestant Ministers who helped design the New Mass were: Drs. George, Jasper, Shepherd, Kunneth, Smith and Thurian. Paul VI even admitted to his good friend Jean Guitton that his intention in changing the Mass was to make it Protestant. In the chapter called 'Communist infiltration of the Church', did you know that the Vatican II sect was honoring the Soviet state-implanted "hierarchy" while deliberately abandoning the priests who were standing up to Communist oppression? Or that then-"Cardinal" Montini's private secretary was discovered to be a Communist agent whose activities led to the deaths of priests in the Russian bloc? Or that while the real Church always condemned Communism, the antipopes went out of their way to praise it? Or that then-bishop Wojtyla was the only bishop allowed free travel in Soviet Poland? Rama Coomaraswamy further demonstrates how the post conciliar church is actually the continuation of the modernistic views propagated by Antipope John the 23rd, reaching fruition in Vatican 2, effectively muting the voice of tradition while propagating the errors of modernism. Father Coomaraswamy argues convincingly that if you accept the Council of Trent and Vatican I you cannot accept Vatican II and the "New Church". Like Father James Wathen in his tour de force The Great Sacrilege, Father Coomaraswamy presents an overly convincing case that the Roman Catholic Church (except for a marginalized faithful remnant) no longer exists as a social institution. It has been destroyed from within and reduced to a remnant. The Catholic Church now can only be found among those scattered faithful to the pre-Vatican II teachings. On Sept. 19, 1846, the Church approved apparition Our Lady of La Salette prophesied that Rome would lose the Faith and become the Seat of the Antichrist in a final days apostasy from the one true Catholic Faith. While the author has many great insights, sometimes his theology lacks clarity and decision. For example, after the author proves that the antipopes are not Catholic, and that the sedevacantist position (that there is no currently reigning pope) is the correct one to hold, he seems to concede that it is OK for a Catholic to believe the nonsense that John Paul II, et alius, are popes "materially" but not "formally" (a modernist innovation that the Church never held). As another example, after irrefutably showing that the new Mass and new Rite of Ordination respectively lack the sacrifice, tradition and apostolic succession, he then claims that the new Mass and Ordination of priests are only "doubtful" - not unquestionably invalid. The greatest flaws, however, in the book, are its promotion of heresies. After quoting John 3:5 ("unless a man be born again of water and the Holy Spirit, he shall not enter the kingdom of heaven"), Coomaraswamy then in effect calls Christ a liar and claims that one does not need water baptism in order to enter heaven. (This is the heresy of baptism of desire, and it is thoroughly refuted by the online video "Baptism of Desire Buried".) He also promotes the idea that someone who is "invincibly ignorant" of the Gospel can be saved. Not only does this (again) deny the necessity of water baptism, but it was never held by any Doctor or saint of the Church. (These issues are thoroughly covered in the book *Outside the Catholic Church There is Absolutely No Salvation*, available from Most Holy Family Monastery (also see Most Holy Family Monastery Beliefs, Heresies and Practises Exposed in order to be aware of their soul slaying heresies). To further show that the Sacrament of Baptism is necessary for salvation, I will quote numerous infallible statements from the Chair of St. Peter. In order to prove that one cannot obstinately regard Antipope Francis as a Pope without becoming a heretic, here are some of his worst heresies which proves that he is a complete heretic. In contrast to Francis, the Council of Florence dogmatically defined that any individual who has a view contrary to the Catholic Church’s teaching on Our Lord Jesus Christ or the Trinity, or any one of the truths about Our Lord or the Trinity, is rejected, condemned and anathematized by God. How clear is that? And what’s really outrageous about this statement is that he’s essentially spitting on and mocking the martyrs, who suffered, died, were tortured, for teaching, preaching and spreading the true faith; and this apostate has the nerve to call it a solemn nonsense. That anyone claiming to be the Pope says such an evil statement, is incredible. The Catholic Church infallibly teaches that atheists are condemned and that they must be converted to the Catholic faith for salvation. Yet, Antipope Francis is dominating the headlines around the world with his assertion that people don’t need to believe in God to get to heaven. His position is of course, heresy and apostasy. He made a similar statement in an open letter to the founder of the newspaper La Repubblica. Statements like this only confirm what we’ve documented about the Vatican II antipopes, and what was proven in the video “What Francis Really Believes.” I’ve read Francis’ entire letter. The headlines accurately reflect what Antipope Francis wrote in his Evangelii Gaudium. Here Francis clearly indicates that people who don’t believe in God can be forgiven and saved if they obey their own conscience and follow what they perceive to be good; and later in his “Evangelii Gaudium” (254) he confirmed that this indeed was what he meant. So don’t allow any liar to claim that Francis’ statement has been misrepresented. It has not been misrepresented as Francis himself confirmed.